I was so focused on plotting out Leftover Ham Week on the blog that I didn't really leave myself room for a post about Easter recipes. Newbie blogger mistake, I'm sorry. So, on a rare departure from my Monday, Wednesday or Thursday, and Friday (pizza) posting schedule, I'd like to share a special Sunday post. It's kinda crazy, because we're actually joining my folks at the dining room of their temporary March residence for Easter this year. However, because my family loves ham (and I'll soon share some of the awesomeness that can be made from leftover ham), I will instead share what I've recently made, or seen around the food blogs, that would make up a tasty Easter or Spring meal. First, a comment about portion size. Most of my plated dinner photos are taken on our usual plates which measure 8 inches across (20 cm). For special meals, like above, we use these slightly larger 9.5 inch (24 cm) plates. We moved to these smaller plates years ago when the airlines put that liquid restriction into place, and I truly believe it makes a difference in our family's overall food intake. There's no correlation between the liquids and the plates, it's just that my brother brought me the plates from Austria as the airlines were cracking down and it was an eventful journey so I always remember when we got them. Back to food. We love ham, so I'll pick up a spiral sliced ham at Costco during the final sled hockey practice of the season. 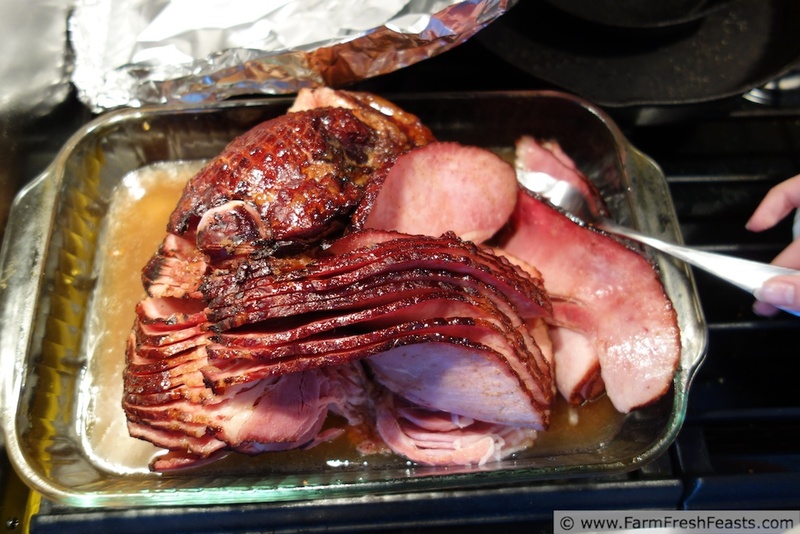 I used to just use the glaze packet that came with the ham, but this glaze from Deborah at Taste and Tell Blog looks delicious. If you don't want animal meat but wanted a fancy fish dish, this Grapefruit and Pistachio Salmon from Aggie's Kitchen looks really appealing to me. To keep things thoroughly veggie, I love the looks of this Vegetable Invasion Quiche from Kristy at Gastronomical Sovereignty and this Leek and Goat Cheese Quiche from Heather at In Her Chucks looks perfect for the CSA farm share leeks I've still got put up in my fruit and vegetable freezer. 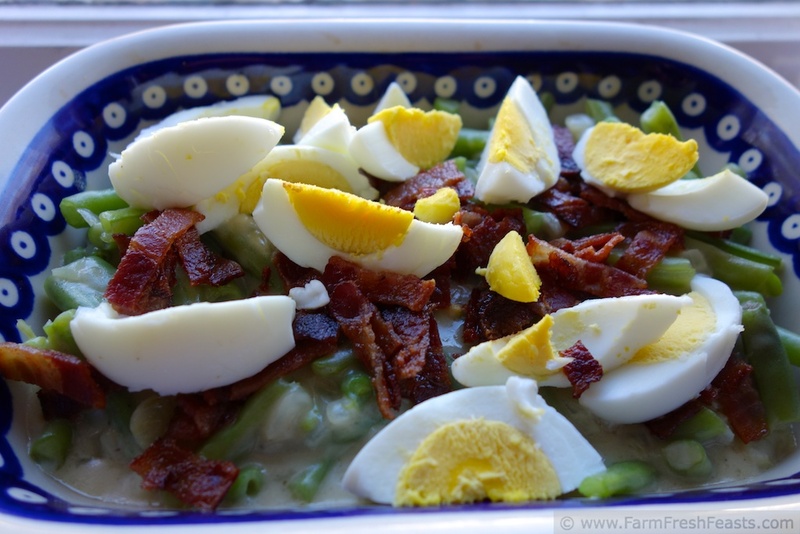 Since eggs symbolize Spring and Easter so nicely, this Pennsylvania Dutch Green Beans and Bacon from Alanna at A Veggie Venture provides a pretty egg-topped side--and a good use for leftover hardboiled eggs. Since Easter is so close to St Patrick's day this year, and I picked up a few cabbages when they were cheap, a side of simple sautéed cabbage wouldn't be out of place. Another pretty side are these Maple and Cardamom Glazed Carrots from Alyssa at Everyday Maven. I love their color--it would pair nicely with the green beans and eggs, like the orange of my V8 bread in the bread machine (no link because I copied the recipe from somewhere onto the inside cover of a bread machine cook book long ago--let me know if you want it). Instead of that bread, I think these Rosemary Drop Biscuits from Meghan at Clean Eats, Fast Feets would be just delicious. My family would go on strike if I didn't include a crock pot full of my friend MA's Irish Mashed Potato Casserole. For dessert, I really can't decide between these Chai-Spiced Carrot Cupcakes from Lauren at Gourmet Veggie Mama, or too many choices from Carla at Chocolate Moosey and Karly at Buns in My Oven. I've really got a hankering for a homemade Peanut Buster Parfait, triggered by Julie of Texan New Yorker's Tin Roof Ice Cream, and I am tempted to make it healthy using Heather of Kiss My Broccoli's Healthy Chocolate Sauce, though I may have a jar of Graeter's sauce in the pantry . . .
Everything in moderation, though I wish that Spring would go all out, instead of the snow storm we've got brewing today. 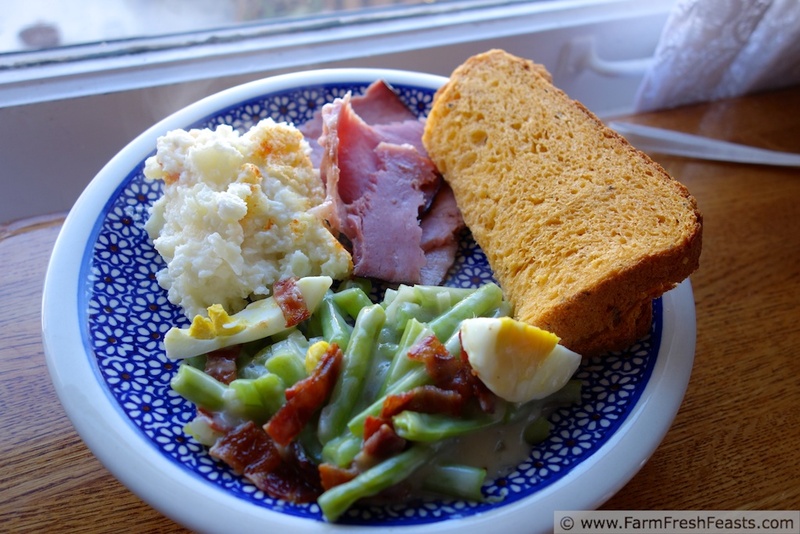 What are you planning for and Easter/Spring menu? I'm always looking for new ideas and will be enjoying a deluge of veggies from our CSA farm share in less than 2 months. Please share here, or on my FB page. This post is shared at The Clever Chicks Blog Hop at The Chicken Chick, Cookin' Canuck's Easter Recipe Link Up, What's Cookin' Wednesday at Buns In My Oven, Taste and Tell Thursday, What's In The Box at In Her Chucks, Food on Friday and the Farm Girl Blog Fest. Simon likes his Easter ham, too. What a great idea with the Easter recipe round up and thanks for the shout out. I was thinking about doing a recipe for my mama's scalloped potatoes which pair perfectly with ham, but alas I didn't think of it until yesterday, and I've already got a bunch of stuff planned for this week. If by some miracle, I bump something and get it up on Thursday, I feel it will be too late. Everybody will already have their Easter menus planned or are even worse, doing those horrible cheesy potatoes with everything processed. Ack. I think I'll take a page from your book and do pictures and the blog and save it for next year. By the way, Simon is adorable and I love seeing him on the blog. One more by the way, I read this post last night and was wondering, "What snow storm." This morning I've got my answer. Scalloped potatoes sound delicious--my dad's side of the family is known for their scalloped potatoes, which my mom learned to make, though I don't think I've ever made them before, which needs to be remedied. I'm not a list person, as you know, but apparently I can work ahead ok. Thank goodness the Blogger stuff has ways for me to save it so I don't have to remember to post when the actual time comes. I did just pick up a ham during hockey last night, so my post-Easter Easter menu is started but not set. Of course I also picked up salmon at the same time, though we're nearly out of eggs. Because I didn't go out in the Big Snow . . .
Simon is such a beautiful dog! I love recipe round-ups, I need to do one soon. Thanks for the shout-out, that ice cream is really delicious. And I'm so with you - where is spring??? I'm so sick of winter weather! As I type this, it's snowing outside. Happy Easter though!! I've resolved the next time I find a gallon of whole milk marked down it's going into ice cream. I'm so craving this stuff. I am catching up on blog reading after getting behind over spring break last week. Love the recipe round-up! We are going to my parents' for Easter dinner. I think Mom said something about getting a turkey this year. I wasn't clear if she was doing it instead of the ham, or in addition to it. I am taking deviled eggs, dyed eggs and dessert. I really need to get cracking on my plans for dessert! Probably a cake in my lamb pan, but not sure what kind yet. I have been thinking more about dyeing eggs than baking, to be honest. Might try some natural dyes this year. We'll see. I've been seeing so many pretty, vibrant natural-dyed eggs on blogs lately. It looks like so much fun! It sounds like your family will enjoy a bountiful Easter. 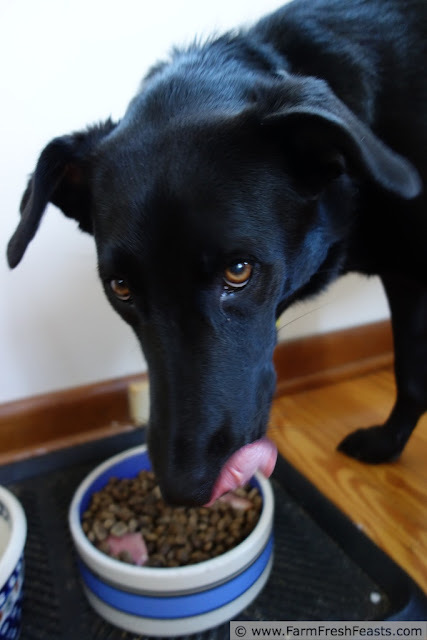 I love the photo of your dog!! lol That says it all! Thanks for the love! All those recipes sounds amazing. Let's do Easter all over again...I can't wait until next year. Thanks for sharing and linking up. ps: what kind of bread is that on the side? Looks like sweet potato? I could do Easter again. Of course we ate 2 Easter meals last Sunday anyway . . . The bread is a V8 bread I do in my bread machine. I don't know where I first got the recipe, but I ended up copying it onto the inside of a bread machine cookbook so I wouldn't lose it. I lost a bunch of handwritten recipes leaving Japan and even with the giant internet I never found some of them again. lastly - you are awesome. that is all.